Sofrito is the backbone of a wealth of classic dishes from a number of cuisines, and a few of those dishes are on my site: Poor Man’s Paella, Ratatouille, Basque Chicken and White Bean Ragout on Toasted Garlic Bread are family favorites. The uses for Sofrita are almost endless. If a recipe starts out with sautéed onion, peppers and has tomato, I’m already thinking Sofrito. A trough won’t fill in when Sofrito is done. I’m going to talk about a basic cooked Sofrito, using what I have available in my area. Now, a purist might say, “Oh, a REAL Sofrito uses this kind of pepper, or always has this or never has that,” or “No one from such and such a place would make a Sofrito like that.” And I’m not saying that’s wrong – there may be certain dishes that you’ll want to make with a Sofrito that’s tailored to the area and the particular dish and replicates a certain flavor. Frankly, though, every country, every region adapts to whats available, freshest and local, and that’s what makes for the wonderful variations and flavors in the food we have today. 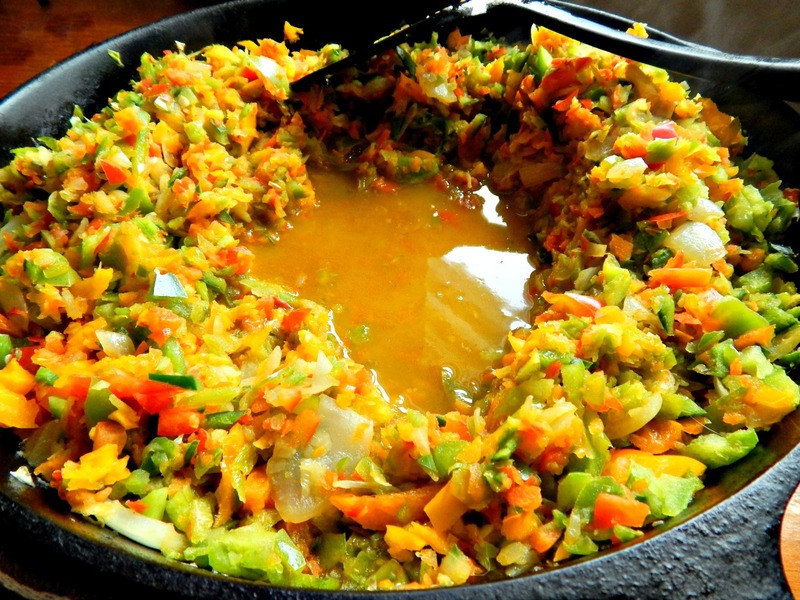 As a matter of fact, I want you to make your Sofrito using what you have and what you like! If you’re prone to making dishes that call for certain peppers or ingredients, use them here. Adapt away! As you’re making your dish, with this basic sofrito in the freezer, you can always add any special little touches during the preparation. This Sofrito thaws easily and I often toss it frozen right into the pan when I’m cooking. Sofrito, ready for the freezer. All vegetables should be chopped into s small dice, but this doesn’t have to be perfect and a little variation is nice. Use a food processor for this to speed things along – just roughly chunk and process each type individually – don’t mix pepper and onions together, for instance, because the peppers will be mush by the time the firmer onion is broken down. You can roast and peel your peppers if you’d like to, but that really depends on if you want the smoky flavor in your sofrito. Some dishes rely on it for flavor, and others don’t. In a very large, heavy skillet or dutch oven, heat the oil over medium-high heat. Add the onion and cook, stirring often, for 10 to 15 minutes or until golden brown. Add peppers and cook, stirring often, for a few minutes or until peppers are turning a bit golden. Add garlic and cook until the garlic is cooked through; be careful not to burn. Add the tomatoes and cook, stirring often, until the mixture is thick and jammy. If tomatoes are a little weak in flavor, add in the tomato paste just to boost it up a bit. After vegetables are softened, move them to a colander over a bowl and let drain 15 minutes or so. Heat the pan up, add the juices and cook until the liquid is very thick. Add the vegetables back in (along with any extra juices) and simmer. In a surprisingly short amount of time you’ll have a rich, jammy sofrito. Let sofrito cool and portion out into Ziploc bags or ice cube trays. I portion in Ziplocs in one cup portions. When using ziplocs, open and label all bags first. Filling is easiest if the Sofrito is all portioned out on a sheet pan or plate. It’s easy to fill the bags with little mess or bother. Shake each bag down, roll and freeze, flat on a sheet try. Gang them up into a larger bag so there’s no need to search for them when needed. Each cup of Sofrito contains (approximately) about 1 1/2 cups each of tomato and peppers and 1/2 cup of onion. Too much liquid in the Sofrito? Strain and reduce the liquid, add the veg back in. This entry was posted in Click here for Fabulous Food Posts and tagged Bell Peppers, Cubanelle, Easy Recipe, Freezes Well, Frugal Hausfrau, Latin American, Olive oil, Sofrito, Tomatoes. Bookmark the permalink. I got a new food processor for Christmas, and this will be perfect to try it out. I can think of lots of ways to use this in my cooking! I am out right now!! And missing it! I dream of the days when I have my own paella pan and make it outside on the patio for a dozen friends – a cool breeze, lovely stars, lots of sangria! I bet you have a good sangria recipe!